With all the new types of Hardwood and Laminate floor compositions, you may not know the best way to care for your Hardwood or Laminate Floors in Birmingham, AL. Different types of manufacturing techniques are being used to produce a wide assortment of floor coverings. These new techniques are giving homeowners more options to choice from, but also raising questions about how to properly care for these different types of laminate and solid hard wood floors. Here are some simple tips to help you clean and maintain these types of floors without harming them. 1. Always check the manufacturer’s guidelines first as they may have warranty restrictions, as well as instructions for the proper maintenance and care. 2. Use the proper technique for removing dry soil, such as a cloth dust mop or microfiber dust mop. Avoid using anything abrasive like a bristle broom. Use a dull plastic scrapper to remove gum, tar and grease. Never use metal. 3. Use proper cleaning solutions, such as plain water and a mild cleanser. Harsh chemicals can damage laminate floors protective coatings. Always consult the manufacturer’s warranty. 4. Don’t use too much water! And, never pour or slosh liquids directly onto the flooring. Water and moisture can harm hard wood floors and laminates. So, use only small amounts of water and cleaner and work in small areas. 5. Make sure you thoroughly dry the surface! 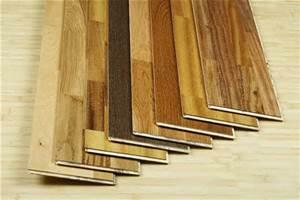 Don’t leave any standing water or cleaning solution on the hardwood or laminate as it can damage the finish. Either wipe dry with a soft cloth or micro fiber mop or use fans to help the floor dry quickly. If you are still not sure what to do, call Heaven’s Best Carpet Cleaning at (205) 618-9150. We know how to clean, polish, wax and buff all types of hard wood and laminate floors. We have special cleaning solutions that are specifically designed to be used on hard woods or laminate floors. We will clean, polish and buff your floors, so they look like new. For the Best Hardwood and Laminate Floor Care in Birmingham, AL, let Heaven’s Best help. Heaven's Best Carpet & Upholstery Cleaning is a Veteran-owned, Full-service Carpet, Upholstery & Floor Cleaning Company specializing in Low-Moisture Carpet Cleaning, and certified by the Institute of Inspection Cleaning & Restoration (IICRC). 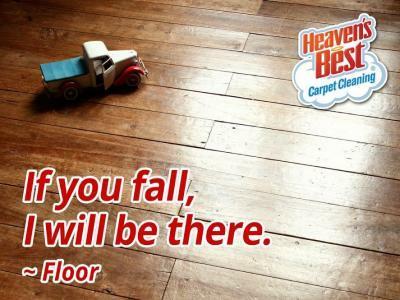 Contact Heaven's Best for a Free Floor Analysis & Estimate!